Zeiter's Septics is an eco-friendly service company that unclogs and maintains any type of drains including sinks, showers and toilets. Chicago will no longer experience any type of over- flow issues when Zeiter’s Septics is in charge of the drain cleaning (http://www.zeitersseptics.com) process. Zeiter’s Septics is a family owned and operated small business in Morris, Illinois and services Will, Bureau, Cook, DeKalb, DuPage, Grundy, Kane, Kendall, Kankakee, LaSalle, Livingston and Putnam counties. This company has seen the worst of draining problems and has had remarkably overcome every challenge while saving customers time and money. Most customers choose Zeiter’s Septics due to their reasonable fees, quick and quality service and friendly staff. During these clogging disasters or even for regular maintenance, drain cleaning (http://www.zeitersseptics.com/illinois/chicago) can be quite stressful for the customer. Working with the right company helps to relieve that stress. It’s relieving to know that there is at least one company with a customers best interests at heart with low pricing, great staff and speedy, top- notch work. In addition to drain cleaning, Zeiter’s Septic also offers free consultations for septic systems, performed septic cleaning, maintenance and installation among many other services for their home’s draining and sewage needs. Service request forms are available online and someone is always available to speak about these services during offices hours. This is effective for all Will & Cook County residents. Service locations also include Bureau county. For more information about Zeiter’s Septic and their environmentally friendly drain cleaning services, please go to their website http://zeitersseptics.com. Make sure to browse the photo gallery and video section for testimonials and other services offered. 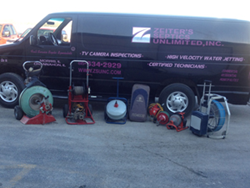 Serving over 9500 for over 30 years, Zeiter’s Septic is the reliable company for all drain cleaning needs. Zeiter’s offers a full-service septic tank repair, pumping and maintenance as well as other related high quality services. We serve Morris, IL including Will, Grundy, Kendall, Kankakee, Dupage, LaSalle, Livingston, Kane, Cook and Bureau Counties. Despite where the septic tank came from, we are able to maintain, clean and repair any type of septic tank. As a service based company, we are on the road and serving you day and night. Our regular operating hours are Monday through Friday 7AM to 4PM and emergency hours available.